Vietnam, as an active and responsible member of the ASEAN community, strongly backs the cooperation in promoting gender equality and female empowerment between the Association of Southeast Asian Nations (ASEAN) and the European Union (EU). The statement was made by Deputy Minister of Labour, Invalids, and Social Affairs Nguyen Thi Ha at an ASEAN-EU dialogue on gender equality and empowerment for women and girls held in Hanoi on October 22 by the ministry, the ASEAN Secretariat, and the EU delegation to Vietnam. Ha expressed her view that the dialogue will offer a chance for countries in the two regions to share experience and intensify collaboration in gender equality, thus helping them achieve sustainable development goals (SDGs) and ensure no one is left behind during the development process. 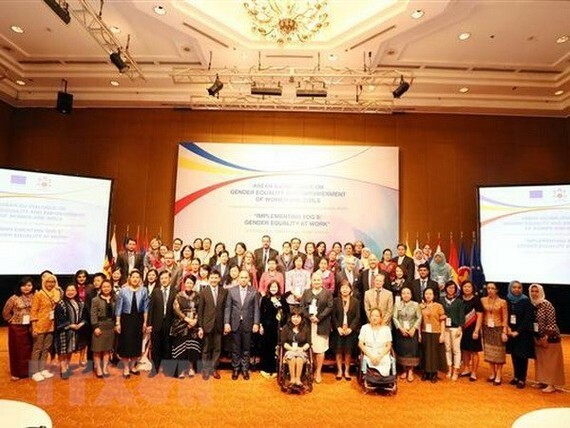 Kung Phoak, ASEAN Deputy Secretary-General for the ASEAN Socio-Cultural Community, said that the bloc pledges to achieve the target of gender equality and empowerment for women and girls as mentioned in the ASEAN Vision 2025 as well as its main documents. Last year was a successful one for ASEAN in terms of honouring women and girls, he affirmed. Henriette Geiger, Director for People and Peace at the European Commission and Directorate-General for International Cooperation and Development, stated that the EU will continue to promote gender equality within its territory as well as in its relations with its partners, especially in development cooperation activities. During the dialogue themed “Implementing SDG 5: Gender Equality at Work,” delegates discussed challenges and factors in improving the implementation of SGDs related to gender equality at national and regional levels. They also highlighted the importance of gender equality and empowerment for women in the workplace, going on to define specific cooperative points in this field for the future. They also made recommendations on gender mainstreaming measures and how to step up coordination activities between the two regions in this field.